The first cool wind of autumn always reminds me that my husband Nick's birthday is just around the corner. We departed from Reims in the Champagne region of France towards the tiny province of Hainut about 10km past the French/Belgian border. Nick and I zipped around sharp corners on a narrow road, through tiny villages with one traffic circle, past multiple nameless green meadows dotted with white and black sheep, perfectly framed in bright fall foliage (to see our whole road trip experience, check out my article Two for Road). As we ascended the hill toward Chimay, we could see the spires of the church and Scourmont Abbey in the distance, so we knew the cozy L'Auberge de Poteaupré where we were to spend our afternoon and evening must be close. My idea of a remote and quiet inn was quickly destroyed however, as we realized the popularity of the Chimay brand brings hundreds of visitors to crowd the restaurant each day. 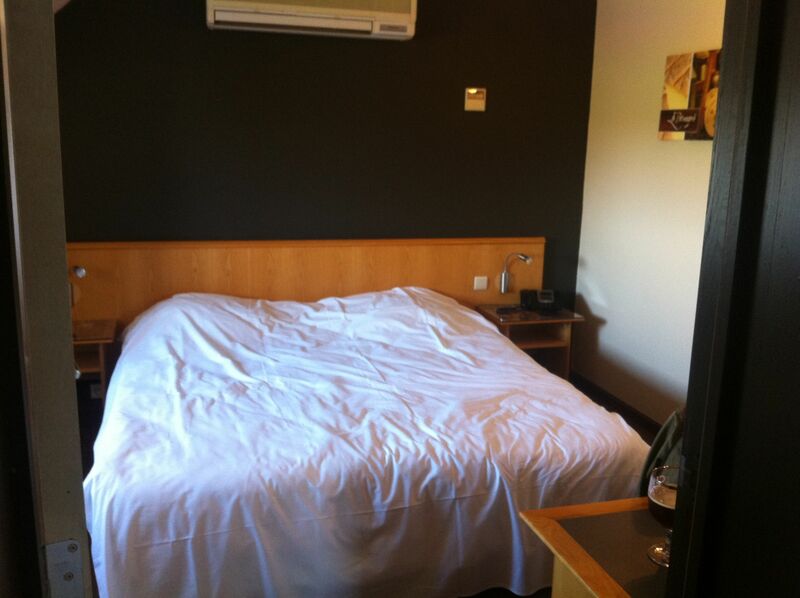 My lack of French and the noise of the room made it nearly impossible to find someone to check us into our hotel room, but thanks to my Talking French Phrasebook app by CoolGorilla and some hand gestures, we eventually settled our bags into our spacious quarters just above the restaurant (only 65€ a night for a double). Nick made a beeline for the mini fridge and I watched in hilarity as a bright smile covered his face. 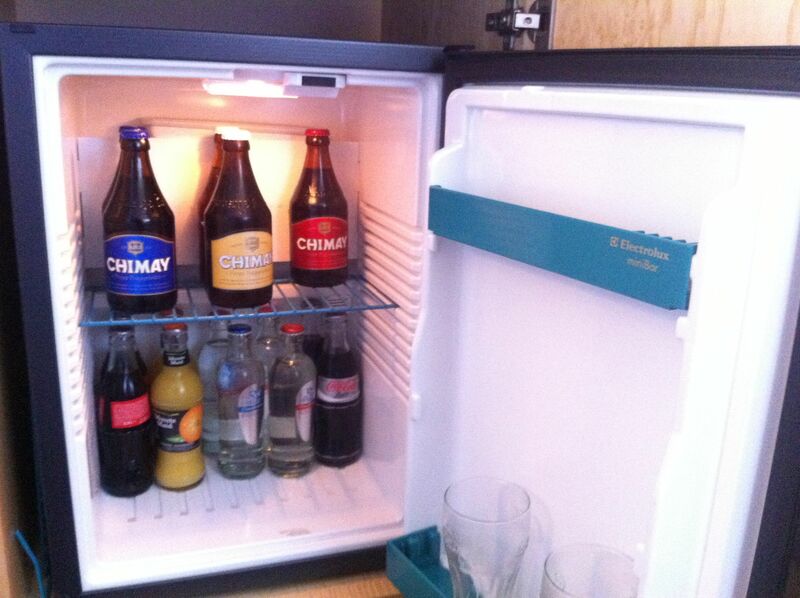 Our fridge held precious contents: red, white and blue colored Chimay, for only 2€ a piece. Happy birthday to Nick, for he truly had found his own slice of heaven. Since the crowd downstairs forced us to wait an hour for lunch, we threw back some Chimay in our room as we relaxed for a bit. We then headed downstairs and enjoyed a hearty and inexpensive lunch of Le potage du jour et sa brochette de fromage de Chimay (Soup of the day with a Chimay cheese brochette) for only 5€. Nick chose the Chimay Rouge and I chose the Chimay Triple to accompany our meal. We did some major coveting of a child's ice cream next to us and then broke down and ordered La dame blanche Poteaupré (vanilla ice cream with real melted chocolate and whipped cream). So simple and yet sinfully decadent. After lunch, we jumped into our Peugeot rental car and drove the mile over to the Notre-Dame de Scourmont Abbey and the monastic community. My breath was immediately taken away by the vibrancy of the autumn leaves and the serenity of this little place. Surrounded by park-like trails, statues and a tree-lined avenue, the respite of the Abbey was permeative. The facility for beer production is not open to the public, but nevertheless Nick and I enjoyed walking the grounds and enjoying the fall weather. We then strode along the trails and sat on a bench overlooking a crop field before we jumped back into the car to drive to the actual town of Chimay. Chimay itself is a medieval town on a hill, comprised of stone walls that zigzag sharply up to the pinnacle. The locals jumped out of the way in fear as Nick maniacally ground through gears and sped up towards the top. We parked alongside of the road and then mounted the innumerable stone steps towards the Château Des Princes de Chimay and town center. (Tours are given by Princess Elizabeth of Chimay from Easter to September 30). We admired the stone architecture of the castle and continued on toward the main square, just as the sun was setting and the church bells rang the hour. Our stomach growls inspired us to head back to the auberge to enjoy a night of ale tasting. We decided to get down to business and settle a problem: Which Chimay ale would be our favorite? In order to fairly judge this, we each needed a significant amount of each color: red, white and blue, and we needed to taste the elusive brew that's only served there at the inn, the Spéciale Poteaupré. We started out each ordering The Quadruple from the tastings page of the menu. This consisted of a wooden contraption bearing 18cl glasses of the the Chimay Rouge, Chimay Triple and Chimay Bleue respectively, along with 25cl of the Spéciale Poteaupré. This monument to beer costs us only 6,50€ each. To accompany our beverages, we shared an order of the Board of Four Chimay cheeses served with bread for only 5€ (included the Classique, à la bière, Grand Cru and Vieux Chimay cheeses). It was a tough job, but someone had to sample all of the wares of this town, and I felt I owed it to Nick. It was his birthday, after all! To my surprise, I have morphed into a dark beer girl. The Chimay Bleau won my affections, although I love them all in their own way. And each cheese was delectable and complemented the varied beers. We decided we might need a bit more than cheese for our stomachs while we consumed this high-alcohol-content ale (ranging from 7-9% alcohol by volume), so we ate more cheese by each ordering the Homemade Four Chimay Cheeses Quiche. We should have split that for sure, but it was delicious nonetheless. We drove away from the auberge, our hearts warmed by the kindness of a stranger, the fullness of historic ale and the hospitality of a small town. The fog lingered in the colorful forest, and I made a vow to return someday. Only time will tell. It's certainly not convenient unless you drive, which is pretty easy as long as someone can navigate for you. If you don't have a car, the best bet is to get to Brussels and take a 2-hour train to Couvin (change trains in Charleroi). From there, take bus 60/1 to the town of Chimay. But honestly, driving is the best way. Please keep in mind the high alcohol content of the beer. If you plan on tasting more than 1 ale at the auberge, plan on staying the night and avoid driving afterwards. Viewed 6830 times so far.